Thanks for that, Introibo, but it's of zero interest to me, because in the end it's all speculation. I'll stick to Church Theology insofar what happens to people after they die. I have ansolutely no curiosity in NDE, so-called. Years ago I recall the press doing beat-ups (always a bad sign) on NDE, and nearly every case I observed had a fatal flaw/s (laughably false in most cases) in it. I don't consider NDE in any way as useful evidence of God, Heaven and Hell. The teachings of the Church provide all the proof of the above that I require. And I don't think that anyone should even dream of using NDEs as a proselytizing tool. It's awesome you're strong in the Faith! However, for those who are agnostic, I think NDEs may provide some food for thought that we are not just matter. That might lead them to investigate and ultimately accept the Faith. 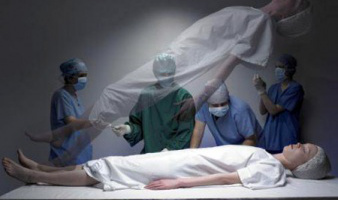 The NDE's where a person starts to see his whole life seems to fit a little as we instantly go before Christ at our death and see Our whole life and are judged. The only real issue with NDE's is as you said, people interpreting what they saw to support their false Religions. As an ex-Pagan, I can testify to the fact that they treat NDE's as a huge heavenly sign. A lot of them can see bliss and immediately interpret Universal Salvation. Their main value lies in atheists/agnostics who are willing to look at them and believe that something else exists after death. But, again, the problem lies in the fact that Pagans have a huge culture around them, and that can easily lead people away from the Catholic Faith. It's a double-edged sword. NDEs can lead people astray who give wrong interpretations, lie, etc. However, we should make use of them when we can--there must be a reason God allows them! Good point! God allows everything to happen for a reason though, so no matter what, everything that happens has a purpose. In all the accounts of NDE's that I have read, none of them seem to be from well formed traditional catholics. The average NDE story is from a lukewarm protestant unchurched person. They see some light and relatives and are told they have to come back and amend their lives and perhaps tell others. Where is Our Blessed Mother in these accounts? I don't doubt their experiences. What I find troubling is the clear lack of traditional catholicism these experiences impart on the individual. For this reason, I suspect satan is up to his usual tricks. He can be painting a deceptive picture of a nebulous salvation with only a token commitment of ammending ones life. Carholic history has many examples of men who actually have had face to face encounters with the Divine. They were changed and became zealots, preaching the Catholic faith. St Paul, St Thomas Aquainus, and Moses. Now I do agree that all souls are given graces for salvation in their lives and its up to them to accept or not. Perhaps these NDEs are graces for a chosen few. But overall, I am leary that they are from God. We are in basic agreement Tom. You make valid points. The amount of research that has come out within the last 10 years or so has made me rethink my position. I, too, am leary of MOST NDEs, but some may be authentic graces from God based on the reports. The typical recipient of an NDE is no longer a Protestant, as was the case before the new research. There are few Traditionalists, and V2 sect members are another branch of Protestantism, so maybe that's one reason that lack a distinctive Catholicism; they interpret it according to what's familiar, but it can lead to investigation and conversion (which may be the grace God gives). Could these reportedly NDEs be a form of disassociation? When I was a small child I would leave my body or disassociate when I was being abused. I would be up in the ceiling looking down on the room. Yes. Disassociation accounts for some alleged NDEs. However, there are cases when the person clearly reports things that happened hundreds of feet away outside of the boundaries of human vision and hearing. One case study tells of a man who was clinically dead and gave a detailed account of what another surgeon was doing during an emergency and his the nurses were reacting. This is not something that could be perceived by disassociation. There was a doctor in the seventies, (?Dr. Rossi), who wrote about this. I remember thinking at the time: We have a common process of conception; a common process of birth and so a common process of dying makes total sense to me. I have read and listened to numerous NDE’s and studied extensively on Near Death Experiences, and I can assure you that almost all of them are demonic in origin--even those whom appear to be directly Catholic in their teaching. Why? because even they (the Catholic in their teaching) conform the people in the Vatican II sect, its teachings and antipopes. Sure, even supposing the NDE was true, this effect of them staying in Vatican II was not God’s fault. This much I can agree with, but still, how to explain this?--it is possible a Vatican II adherent can die with the true faith, but it seems hard when there is so much heresies and apostasies taught in the Vatican II sect. The same problem as above I encountered recently with the “Apparition of Our Lady of Revelations”. This apparition started before Vatican II, and was endorsed by the Church, and Pope Pius XII blessed a statue of Our Lady of the Revelations since he approved of it (at least privately), but the visionary and “apparitions” continued way after Vatican II (died 2003), and yet, as far as I know, “The Blessed Virgin Mary”? never condemned Vatican II or its antipopes, and not a word was said about leaving the Whore of Babylon. Miracles also occurred there in the 1980s, similar to Fatima. How to explain this? In the latest NDE I listened to, Mary was declared to be a woman just like everyone else—and the protestans went to Heaven and all are alike there in glory and merit, according to them, of course. That is the common protestant view--that all are like in Heaven and there is no particular merit for persons for their deeds (many do not share this view though). Their “visions of Heaven” is almost always also described in a human way, with gardens, happy family life, with houses and gardens etc., rather than the Vision of God and something supernatural that cannot be explained (for example, St. Theresa explained that the riches or treasures she saw in her soul could not be explained even if she wanted to; and before St. Gemma died, she also expressed a wish to be able to show her friends that was present what Jesus had just shown her; and it seems to me she did not think it was possible to describe what she saw, for otherwise she could just have done so, right?). Not that gardens, family life, houses etc. is false—but rather that I have never seen any saint, ecstatic or Catholic visionary person describe Heaven like this as protestant always do (some even claim shopping malls and treadmills, tvs and all kinds of gadgets are in Heaven; and many protestant NDE’s are plainly ridiculous, absurd and stupid and unworthy of God). NDE experiences are pretty common today, but I don’t think it started to happen like this until the 20th century. This probably has to do with that we are living in the end times when deceptions, false signs, wonders and miracles would be increasing (Matthew 24:24). I am mostly only aware of (pre-Vatican II) Catholic saints and ecstatic otherwise who have beheld visions of God and Heaven, and all their visions have been starkly different from the modern day NDE’s. Many NDE’s also teach direct heresies, such light-beings proclaiming that all people will be saved etc. Of note is that the “feelings” of the people in these new age NDE’s is described and experienced just the same and in the same way as the common protestant description in their spiritual or sensual senses (that is, they have never felt this good or felt so loved ever or seen such beauty)—so satan can (and do) give “feelings” both to the body and the soul and create false Heavens out of thin air or matter (and he can even appear as an angel of light as it says) and God evidently permits him to do this (Matthew 24:24)—so one should not judge it by mere feelings, or by how it looked, but rather if it conforms to Church teaching. Can there come out “good” from an NDE, such as that an agnostic start to become interested in God and the afterlife? Sure. But the real tragedy with these NDE’s and false miracles so abundant in the protestant sects, is that this will result in that they will essentially never be converted (and I mean NEVER--unless by a direct miracle). For how will ever a protestant, that has beheld Heaven and seen his loved one’s being saved, ever be converted, when all this vision did was to conform him in his false faith and that the path he currently walks is the right path? The only false path in (almost) all the protestant NDE’s is to live a somewhat sinful life; but other than that, if they live a “good life”, they are saved “since they have Jesus saving grace in them”—and the NDE’s only help to cement them in this position. I mean, if “Jesus” himself approved of them and showed them their protestant relatives in Heaven, and welcomed all of them (including the one experiencing the NDE) into Heaven as they are, how on earth will such a person ever be converted, or ever believe that he is deceived or in the wrong? It won’t happen! The same can be said with those who were sent to Hell for sin or unbelief yet, who when they were taken to “Heaven” afterwards and given a second chance, saw the same protestant “Heaven” as already discussed. False miracles and NDE’s are the worst punishments in these false sects in my opinion, and they will almost certainly keep them stay in their heresies and errors, since they already believe they know and have experienced God (such as through miracles) and even seen Heaven and that Jesus waits for them there just as they are (that is, as non-Catholic protestants)! I have always wondered about when Catholic writers and saints teach that real miracles will never happen in false sects, and that God could not allow this to happen--either by demons or by Himself--in so far as to seem to prove their religion true with apparent miracles. But how is this to be explained with the almost constant phenomenon that so-called miracles are almost uninterruptedly happening today worldwide in protestant Churches?--even lost limbs and eyes growing back? and unexplained healings happening all the times? And even protestant missionaries doing Catholic-like miracles of former saints? Sure, satan can heal, but there are much more than that going around in the false sects and schisms out there than mere healings! I have one theory: since they are not of His fold, and since they ask of things that in themselves are not evil (i.e., healings, or as in the various miracles described by protestant missionaries in the jungles) they may be heard by God since they will have their reward in this life, and they are not of Him anyway nor will be saved because of these miracles (I think the words in the gospel about people performing miracles in Christ name yet Christ now knowing them may refer specifically to protestants!). Since protestant missionaries actually may help save some pagans provided they receive baptism and did not teach them heresies (or they died before having embraced any heresies or any teaching incompatible with salvation), it is possible God could allow some true miracle happen with them for the good of the pagans? Thank you for your insight and comments. I'm not "pushing" NDEs, to be clear. Most of them may indeed be demonic in origin. However, as we do have souls, let's weigh each NDE against Church teaching as you have written. It would be foolish to perhaps throw out the baby with the bath water! I agree that not all NDE's are false. However, I cannot actually remember thinking, while studying, reading or listening to one NDE, that this one perhaps seems legitimate. Even miraculous conversions stories that brings people into the fold of the Vatican II, however miraculous it may seem, I am sceptical about. Provided an NDE agrees with Church teaching, as you say -- or does not promote false religions or sects -- it may be believable. Do you have any thoughts on my other questions? I was genuinely interested in what others might have to say about it. Like you, I was very dismissive/skeptical about NDEs. They were either false or demonic--or so I thought. I changed my mind with the ever increasing amount of research on the topic. Much research, like that of Dr Jeffery Long, etc. shows NDEs are not nearly as rare as we once thought. Is the individual reporting what actually was--or their interpretation of it? Protestants in good faith may begin the search for the truth, like all non-Catholics who experience an NDE.
" have one theory: since they are not of His fold, and since they ask of things that in themselves are not evil (i.e., healings, or as in the various miracles described by protestant missionaries in the jungles) they may be heard by God since they will have their reward in this life, and they are not of Him anyway nor will be saved because of these miracles (I think the words in the gospel about people performing miracles in Christ name yet Christ now knowing them may refer specifically to protestants!). Since protestant missionaries actually may help save some pagans provided they receive baptism and did not teach them heresies (or they died before having embraced any heresies or any teaching incompatible with salvation), it is possible God could allow some true miracle happen with them for the good of the pagans?" Perhaps! I think we will know more as more research unfolds! Thank you for commenting Jerome! Thanks for your response, and I can agree with what you said, ""that receiving a great grace and cooperating with it are two different things! It doesn't mean you WILL or MUST convert."" but the same problem remains, and the bad effects seem to be more numerous than any good coming out of it. If an NDE did not teach doctrine (but more showed Hell etc. ), I can agree that the person who experienced the NDE may interpret it in his own way doctrinally and put a protestant spin on it. In these cases, I believe NDE's of Hell are more likely to be true and, like you said, receiving a grace (such as a genuine NDE) does not mean one MUST be converted to a more moral life AND the true Faith. As far as I understand it, most are only converted to a somewhat better life while retaining their current faith or embracing protestantism, but since they don't have the true faith or the NDE gave any indication of it (presumably), they will remain, I fear, cemented in their current faith and hence, the NDE may actually have been counter-productive; and it also frequently happens that those who received an NDE openly preach about it to others (such as on youtube) and hence spreads their protestant doctrines along with the NDE received, which in the end only leads to more people being lost and deceived and cemented in false signs, wonders and doctrines. It seems strange to me God would do such a thing when the consequence to me seems that more bad fruit will come out of it than any good fruits. This is just my opinion anyway, and I in no way want to infallibly condemn all NDE's (lacking true conversion or any indication of the true faith) as of the devil; it is just that I don't understand God's reason for doing this in that case, unless the few numbers who will be saved and converted in the end from them are more according to God's justice and will than the many people who will remain in their sin and unbelief because of them. I also wrote about "Our Lady of Revelations". Do you have any theories about have to explain this phenomenon and how to explain it in light of that Pope Pius XII approved of it when it (the apparition) later seems to have embraced Vatican II (or at least, not condemned it)? Did the true Mary stop revealing Herself to the person She converted after the Vatican II and a demon took over (if he had a bad conscience)? or was it perhaps false from the beginning (I don't believe this personally)? or does Heaven have no obligation to explain every detail of apostasy or sin to others (this is a probable opinion generally, but I don't know in this case due to circumstances) to people who may be of good will provided they live in ignorance--believing the Church and doctrines they follow are true according to their conscience? I will be awaiting your response! I find your reference to "Our Lady of Revelations" most interesting. I never heard of it. If you have any citations and/or info, could you please pass it along? Supposing this apparition is authentic, (approved by the pope), I would say that it was true at least until that point in time. After that, for reasons known but to God, (e.g. the seer became prideful, etc) they were led astray by demonic influences. This is just my guess, not knowing anything substantial about the apparition in question and what transpired afterwards. The problem with saying the apparition became false afterwards is that it throws doubt on the whole thing! Why would Our Lady convert someone from militant protestantism and then later leave him (and everyone else connected with this apparition) in the darkness of Vatican II? The seer's name was Bruno Cornacchiola, he died 2001. He was a fallen away Catholic turned militant Seventh Day Adventist. He was determined to kill the pope and attacked the doctrines of the Church, such as those of Our Lady. His conversion happened on April 12, 1947 at the "Tre Fontane" grotto in Rome when “Our Lady of Revelations” appeared to him. A definitive judgement, either positive or negative in regard of Tre Fontane, has not been made. Although, a special statue, representing Mary during the apparition, was blessed by Pope Pius XII on 5 October 1947, and then taken in procession, amidst huge crowds, from St Peter's Square to Tre Fontane. Bruno works as a tram conductor in Rome to support his three children (Carlo, Gianfranco, and Isola). He embraces Communism, divorces [read: separates] his wife, and fights on the side of anti-Catholic forces during the Spanish Civil War in the 1930s. He later returned to his wife but was far from a model husband using foul language, committing adultery and forbidding her to practice her Catholic faith. He converts to 7th Day Adventism and became an ardent prostelytzer. He conceived of a plot to assassinate the Pope Pope Pius XII on September 8th, 1947 the Feast of the Nativity of the Blessed Virgin Mary. Bruno and his children encountered the Virgin Mary at a grotto in Tre Fontane when they are looking for a lost ball. He saw his child kneeling with a radiantly joyful face at the the entrance of a cave repeating the phrase "Beautiful lady!". Bruno couldn't see anything but his other two children began to kneel as well. Afraid, Bruno tried to grab his children and run but he could not move them. A bright light momentarily blinded him and he felt weightless and his soul was leaving his body. When his sight returned he saw a woman of celestial beauty wearing a dazzling white dress with a rose sash and a long green mantle. She said that she was the "One who is of the Divine Trinity" and identifed herself as "Daughter of the Father, Mother of the Son, and Spouse and Temple of the Holy Spirit. I am the the Virgin of Revelation". She admonished Bruno, "You persecute me. Enough of it now. Enter into God's kingdom on earth. The nine first Fridays of the Sacred Heart have saved you. You must be like flowers picked by your daughter Istola- they make no protest, they are silent and do not rebel". (Early in his marriage Bruno had previously in his life attended nine First Fridays prescribed by St. Margaret Mary Alacoque with his wife hoped he would be converted.) "In this place of sin, I will perform miracles for the conversion of unbelievers." (That place known immorality was later turned into a grotto where the dirt was considered miraculous) "Return to the pure source of the Gospel. Pray much and recite the rosary for conversion of sinners, of unbelievers, and of all Christians". Anticipating the proclamation of the 1950 proclamation of the Dogma of the Assumption, she explained "My body would not be allowed to decay. My son came for me with his angels." She gave him a special message to be delivered to the Pope. By 1986 Bruno had claimed 28 additional apparitions by the Virgin, with an increasingly apocalyptic tone. "Through the fault of many men, the Church [i.e., Vatican II] will become a place of meetings and chattering, and not a place of elevation of the Spirit." on April 12, 1980, the 33rd anniversary of the Virgin’s visit, a most astounding public miracle occurred at Tre Fontane in the presence of 3,000 people (including some 25 priests), who had gathered to hear Bruno Cornacchiola recall the first apparition and to attend a commemorative Mass. During the Holy Sacrifice strange images appeared in the sky above the Grotto. The sun seemed to turn backwards in the heavens and began to draw near the earth. It could be seen with without straining the eyes. It appeared bigger than normal, and showed within its corona brilliant and diverse colors, in much the same way as the sun “danced” in the sky over Fatima, Portugal in 1917. The phenomenon lasted about a half an hour. Meanwhile, the Mass that had been in progress was halted so that the people could calm down and return their attention to the eternal Son present on the altar. When the Mass continued it was amid the visible emotions of the congregation. Many lapsed Catholics who had not gone to Confession for years returned to the Faith. There were also many physical cures. A medical center was set up and after extensive research confirmed that the cures were miraculous and beyond any medical or scientific explanation. I find this most interesting, but I have yet to find any authoritative source for "Our Lady of Revelations." It does NOT appear in the list of approved Marian apparitions. (I did a post on the approved apparitions of Our Lady ("You Shouldn't Always Believe What You See" of 10/3/16). Even though it has not been "officially approved", it seems it did receive "local approval", and even "private approval" by Pope Pius XII, who certainly believed this apparition was true, since he blessed the statue for veneration at the apparition grotto. And I would even say blessing a statue for public veneration would make it "public approval" as well, although, not "official" in the sense of the word. Now if Pope Pius XII blessed a statue in connection with this Apparition, and then even used the Church to build up a cult of worship of Our Lady in response to this same Apparition, and even commissioned the Franciscan religious order as overseers of the Apparition site, etc. this does not seem to me to be very far away from "official approval" through some Church document or declaration from the Pope. In fact, it seems to be the only thing missing. As for everything else, there is clear approval, even local approval; and the Vicariate of Rome also gave it their approval after their investigation in 1947. Now as to what you said: "As to the seer's conversion, it may have been a ploy to get people believing in other things leading them astray--a double agent, if you will." I find this theory highly improbable -- not only because it would put evil intentions on the seer that we cannot know (i.e., he was fake)* -- but also because it means the whole Church (essentially) was deceived as well in that case, since there is clear approval of this Apparition in every sense of the word short of "officially approved". *Even though you said "may" and your intention is to find a probable solution according to your conscience, I would never want to make or even suggest such a thing my self without definitive proof, since slander - and putting evil intentions on others motives - is (generally) a mortal sin. In my opinion, it is more probable that it was fake from the beginning (which I doubt - and would never think unless Vatican II happened - since others more competent than me judged it favorable and approved it**); or, if not fake, it was true but turned out false later on when the seer perhaps no longer was receiving apparitions from Our Lady, for reasons unknown to us. If the above is not true, then the other only answers must be that Heaven looks upon the Vatican II sect as the Catholic Church and/or as legitimate and as having true pastors. Most self-professed Catholics and Traditionalists would not have a problem with this position, though. **It is always possible all the relevant information was not known to the people approving of this Apparition. But as far as I know, no false statement or other suspicious thing ever occurred at this Apparition site before Vatican II happened. It was never officially approved. Even then, I'm sure you're aware that private revelations approved by the Church NEVER need to be believed. It is not a sin to outright reject Our Lady of Fatima, Our Lady of Lourdes, etc (unless done out of disdain for ecclesiastical authority). So I wouldn't get upset over it. There are many who put private revelation on par with the Deposit of Faith (I'm not suggesting you are one of them). However, this apparition is not officially approved by the Church (like Our Lady of Fatima) and even if it were it does not oblige us to believe in it at all. The Church's infallibility DOES NOT extend to private revelations. Yes I understand, however, I don't see how a person could have the right faith and reject something like Fatima. Pride goes before the fall. I understand this issue I brought up may be problematic to get a grip on, and one easy solution is that one don't have to believe in it. I agree. But this answer does not exactly solve the problem to begin with! Anyway, I may already have written to much on this issue. I was just looking for genuine answers! I hope no one - like me - gets confused over the issue.